Two brilliant assassins in a fascinating futuristic world need each other to finish one more job before calling it quits in the highly respected killing business. But it’s more of a challenge than either expected. A series of mishaps plagues their every move, and if it’s not Misha helping Rikki with a bungled getaway, then it’s Rikki helping Misha to hide some damning evidence. They can’t seem to get anything right… except for the way they feel about each other. Hmmm, how to describe book one in the Assassins Guild series written by Kris DeLake, aka Kristine Kathryn Rusch–the author of a ton of books. It’s a futuristic, action packed, sensual romance featuring two killers who make no apologies for doing their jobs. The hero, Misha, is a by-the-rules type of man and the heroine, Rikki, is a fly by your pants type of woman. Both are great at their jobs as assassins. Their paths just seem to keep running a bit too close. Misha keeps getting jammed up by Rikki’s kills; he’s been arrested three times for deaths attributed to her. He is determined to find out if Rikki is out to get him. Rikki, on the other hand, could care less. Every time she is hired to “off” someone she researches the target. She doesn’ t kill people so heirs can inherit property or because of silly feuds. She only takes cases which involve people who deserve to die. So when Rikki is hired to kill a high ranking official, she knows that she is being set up. It’s the perfect time for the rule loving Misha to help Rikki. He can also help her examine the role he played in her past. 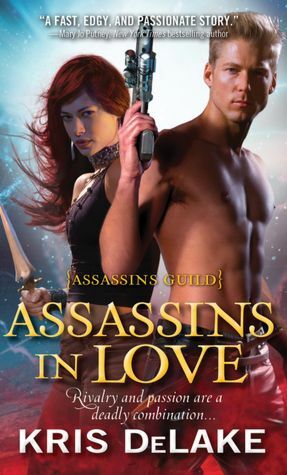 Assassins in Love is a quick read that sometimes made me wonder how the heroine managed to thrive as an assassin. Rikki came across as bumbling and irrational at times which interrupted the flow of the story. Every time she did something like a novice, I rolled my eyes. I mean she’s caught on film, doesn’t always observe her environment and leaves a witness alive, all of which add up to a not so proficient killer. I don’t know how she’s been so successful that she’s considering retirement. Despite my issues with the heroine, the passion filled story was a fun and light read. (Odd that a book about death avoided becoming dark.) It doesn’t portray an overnight type of love, but one in which a couple meet and separate, before reuniting. Through that time they simmer in a mixture of wonderment, lust and distrust. Unintentionally, Rikki and Misha take time to weave together the bonds needed for a lasting relationship. The story makes it simple to follow Rikki and Misha through time because it is divided into three, clearly marked sections. I don’t see myself re-reading Assassins in Love; it’s not one of my favorite books of the year. However, reading about the worlds DeLake envisions made reading the book worthwhile. In DeLake’s world, people travel on spaceships similar to the way people travel on cruise ships today. Credit card implants are used as currency and real meat is a thing only the rich can afford. It’s not calm like Robyn Carr’s Virgin River series. It’s not dark like Jory Strong’s Ghostland World series. It’s not silly, funny or scary. It’s different in a way that makes it slightly better than an average romance. the girl resembles a thinner or lanky Eva Mendes. Not loving the cover, but I’m interested in this one because it’s SFR, and Kristine Kathryn Rusch is a name I’ve heard of.. Hmm. *adds to wishlist*.